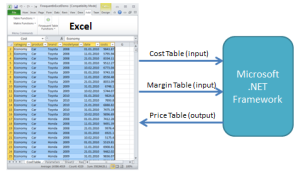 Finaquant’s Excel add-in (Finaquant in Excel) comes with a list of table-valued functions like Table Arithmetics, Combine Tables, Filter Table, Aggregate Table, Distribute Table, and so on. This table function obtains a price table as output from the given input tables for product costs and margins. Note that with table function we mean a function whose input and output parameters are data tables. As shown above, a user-defined table function could be written such that some data tables could be fetched from (or stored into) databases like MS SQL or MySQL. 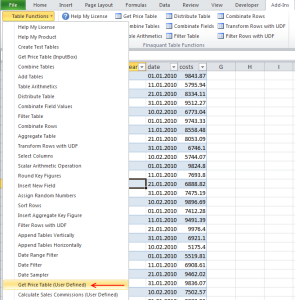 For example, in a rule-based calculation, all the input tables that define the rules of the calculation (like contracts) can be kept in Excel sheets like a cockpit (as User Interface), and the bulk of the input/output data required for the calculation could be stored in an external database. 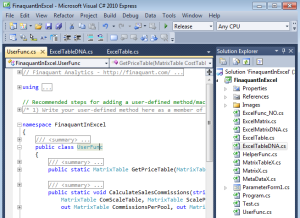 IntroToFinaquantInExcel.pdf Introduction to Table-Valued Functions in Excel (add-in); a Visual Guide with table function examples and developer notes. UserFunc is the class where user-defined table functions are added as new methods. /// Get price table with costs, margins and prices according to given cost and margin tables. // check if CostTable has a key figure named "costs"
// check if MarginTable has a key figure named "margin"
// input checks OK, continue..
First enveloper method GetPriceTable2 defines all the input and output parameters and calls your user-defined function UserFunc.GetPriceTable. This method can directly be called from VBA Excel. Second enveloper method GetPriceTable2 _macro2 reads all the input parameters from a windows form (see the related step below for adding the parameter form) and feeds them to the first method GetPriceTable2 for execution. string FuncDescr = "Get price table with costs, margins and prices. " + "Cost table must contain a key figure named costs, and margin table must contain a key figure named margin. " This method (GetPriceTable2_macro2) in class ExcelTableDNA attributed with ExcelCommand(...) is necessary for inserting a new command item into the Command Menu in Excel (see below). The order of this method within the class ExcelTableDNA determines the order of the corresponding command item in Excel. Add a new method to ParameterForm1 which prepares the parameter form for your table function. 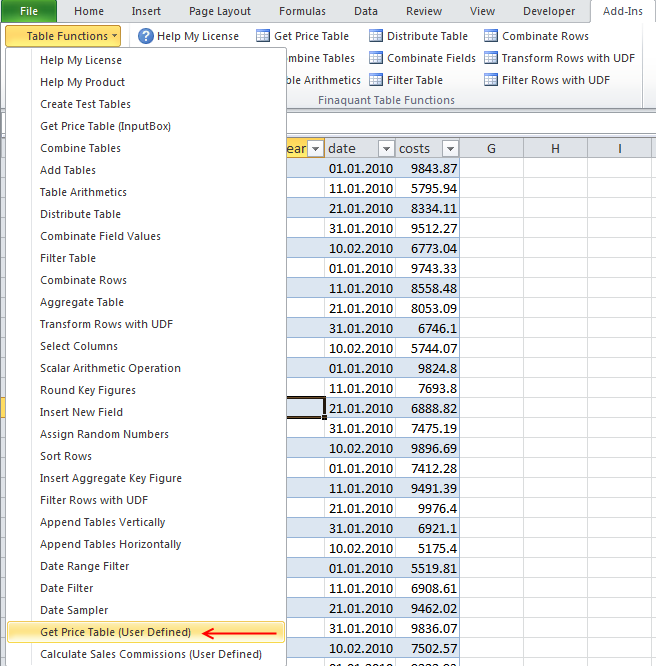 This parameter form will open to collect all the required input parameters when the user presses the corresponding command menu item (Get Price Table) in Excel. You may also need to add some event handlers that are specific to this windows form. 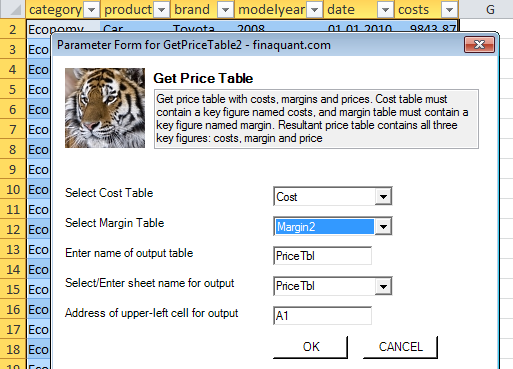 // check if cost table has a key figure named "costs"
// check if margin table has a key figure named "margin"
See add-in’s product page (Finaquant in Excel) for installation steps. Check if your table function appears in the Command Menu named Table Functions in Excel under the tab named Add-ins. You need to update the XML-formatted DNA file FinaquantInExcel_beta.dna in folder Release/bin if you want to see a command button (like Table Arithmetics above) in the ribbon named Finaquant Table Functions. 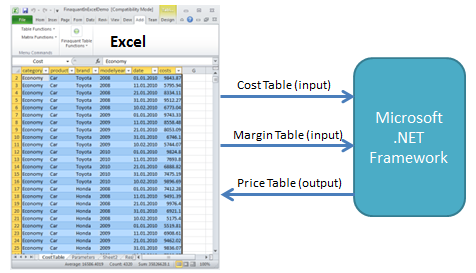 <button id="GetPriceTable2_macro2" tag="Get Price Table"
screentip="Obtain Price Table from Cost and Margin tables(Example UDF)" size="normal"
You can easily produce a single excel add-in (xll) file for distribution using the utility application ExcelDNAPack.exe provided by ExcelDNA. 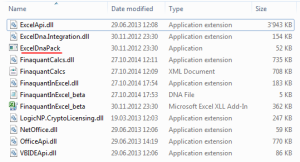 If everything goes well this command will produce an xll file named FinaquantInExcel_beta-packed.xll. You can rename this file as you like before distribution. 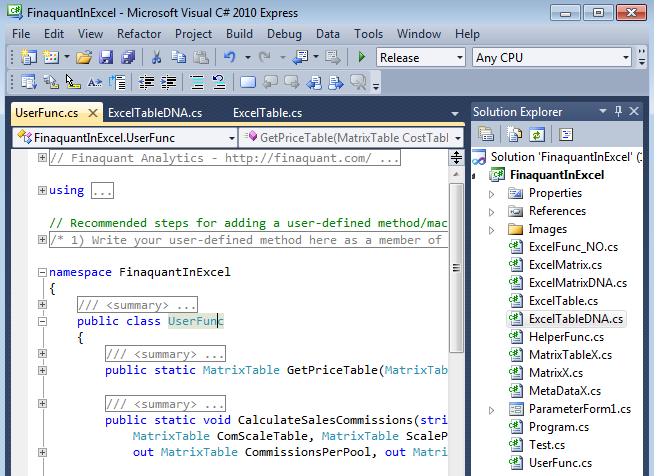 Although Finaquant’s excel add-in was developed specifically for exposing the table valued functions of the .NET library Finaquant Calcs to Excel, its open-source code provides .NET developers with a solid framework for integrating matrix or table valued functions of any .NET library with excel. The development process for adding a new matrix function is very similar to the process explained here for table functions. The main difference is: Enveloper methods in the 3. and 4. steps above are added to the classes ExcelMatrix and ExcelMatrixDNA instead of ExcelTable and ExcelTableDNA. This entry was posted in Calculation engine and tagged development, excel, table functions. Bookmark the permalink.